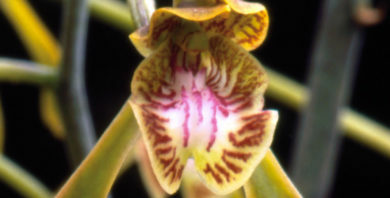 The Madagascan orchid Eulophia beravensis is found growing in deciduous woodlands, sand and dunes, at sea level. This attractive orchid has small white flowers with red veins. The entire species can be saved with your adoption, making it the perfect gift to celebrate the birth of a baby boy or girl. This stunning orchid, Eulophia beravensis, has long, leathery, linear leaves and branched flower stalks (inflorescences). The small flowers are white with red veins and appear in January. A genus of some 230 species, it is the most diverse in tropical and southern Africa, Madagascar and tropical Asia. 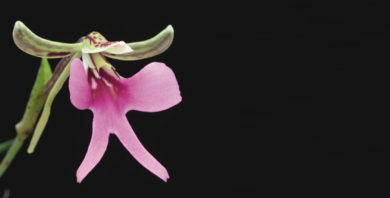 Madagascan orchids come in all shapes and sizes. Some orchids live on the ground (called terrestrials) whereas others grow perched on trees (epiphytes) or rocks (lithophytes). They are found in almost every habitat on the island, from the coast to the highest mountain summit, and from the rain forest to the spiny forest.All orchids are proteced in Madagascar and cannot be collected except under licence. Madagascar is the only country outside the UK where Kew maintains a permanent presence. Our local team, working with Kew UK staff and local institutions, makes a significant contribution to research and conservation in Madagascar and ensures that Kew’s science has maximum impact at all levels from government decision-makers to local communities. You can adopt this entire species as a gift for £1,000. Your donation will be used to maintain the Millennium Seed Bank Partnership, ensure this species is kept safe forever in the vaults, and to collect more species in the future. In addition to receiving your adoption pack featuring your certificate and photograph of the species (this will be posted to you, or the recipient), you will also be invited to a behind the scenes tour of the Millennium Seed Bank, at Wakehurst. You'll meet the staff and see the vaults where your species is stored. The purple-flowered orchid Cynorkis uniflora is only found on the island of Madagascar. It grows up to 20cm tall and is found in grasslands, rocky outcrops and inselbergs. Safeguarding the future of Cynorkis uniflora with your sponsorship makes a beautiful wedding gift and a significant contribution to conservation. Oeceoclades calcarata is a large orchid from Madagascar, growing up to 1.5m tall. It can be found growing on highland rocks and in semi-deciduous western forests. Adopt the entire species as a gift in memory of a friend or loved one, and safeguard its future in Kew's Millennium Seed Bank vaults.